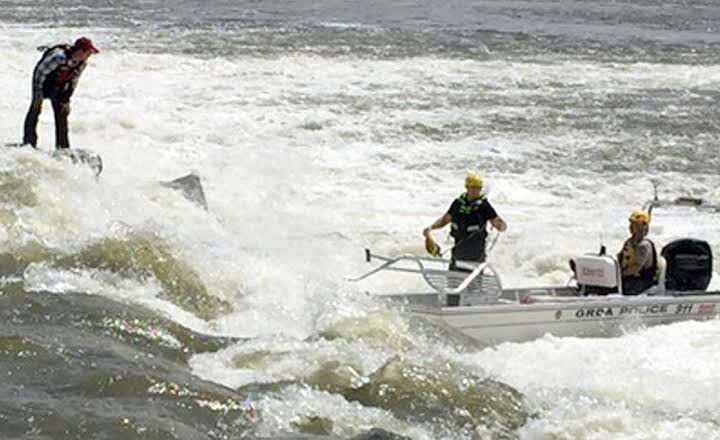 A swift water rescue – performed last week by Grand River Dam Authority Police along with members of the Locust Grove and Pryor Fire Departments below Robert S. Kerr Dam – is a good reminder of just how powerful rushing waters can be. That, coupled with the arrival of spring rains and the possibility of floodgate operations in the coming weeks is prompting GRDA to once again share some important safety information about access areas around its hydroelectric facilities. Remember, it is always “safety first” in these areas where signs, buoys, sirens, fencing and flashing lights are all intended to notify visitors when floodgates are open, generators are operating or water is rising swiftly. Also, keep in mind that is illegal to enter floodwater discharge in spillway areas. SIGNS: Posted at GRDA hydroelectric facilities (Pensacola Dam, Robert S. Kerr Dam and the Salina Pumped Storage Project) to warn of extreme danger in floodgate areas. Please be aware of other signs near GRDA facilities that notify you of no trespassing areas, no diving areas, or unstable footing. Use common sense in these areas and stay well clear of the discharge. FLASHING LIGHTS: At hydroelectric facilities, flashing lights are activated when floodgates are opened or generation is taking place. Fortunately, proper training, teamwork and cooperation led to a successful swift water rescue. However, it is GRDA’s goal that such rescues do not have to take place, because our visitors are able to stay safe and well clear of any swift water areas. Enjoy your outing to GRDA waters, but please heed the warnings, use common sense and watch out for your fellow fishermen. Below – Swift water rescue … GRDA Police Officers Casey King and Lynn Hershberger attempt to rescue a stranded fisherman from the rocks below Robert S. Kerr Dam on Friday, April 14. Fortunately, their efforts, along with other GRDA officers as well as the Locust Grove and Pryor Fire Departments, proved successful. With the possibility of more spring rains in the near future and the chance that floodgates may have to be opened at some point, GRDA is reminding the public to always pay attention to the warning signs, sirens, buoys and lights near its hydro facilities.